In January 2017, a salvage excavation was conducted in Nein (Permit No. A-7874; map ref. 233113–51/726153–204; Fig. 1), prior to construction. The excavation, undertaken on behalf of the Israel Antiquities Authority and financed by Zoabi Musallam, was directed by W. Atrash (photography), with the assistance of Y. Yaʽaqobi and B. Zidan (administration), R. Liran and T. Meltsen (surveying), Y. Kadosh (research assistance), I. Raznitsky (metallurgical laboratory), V. Nosikovsky (organic finds), C. Amit (studio photography), H. Tahan-Rosen (drawing of finds), H. Abu-‘Uqsa Aboud (pottery reading), G. Bijovsky (numismatics), Y. Gorin-Rosen (glass) and K. Covello-Paran (scientific guidance). 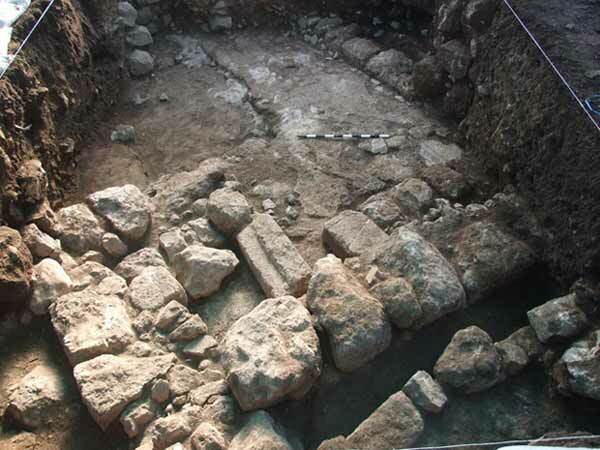 The excavation (25 sq m) was conducted at the center of the ancient nucleus of Nein, south of the Church of the Resurrection of the Widow’s Son. The village was surveyed in the past (Zori 1977:62; Gal 1988:70), yielding pottery sherds from the Middle Bronze Age II, as well as from the Roman, Byzantine and Mamluk periods. 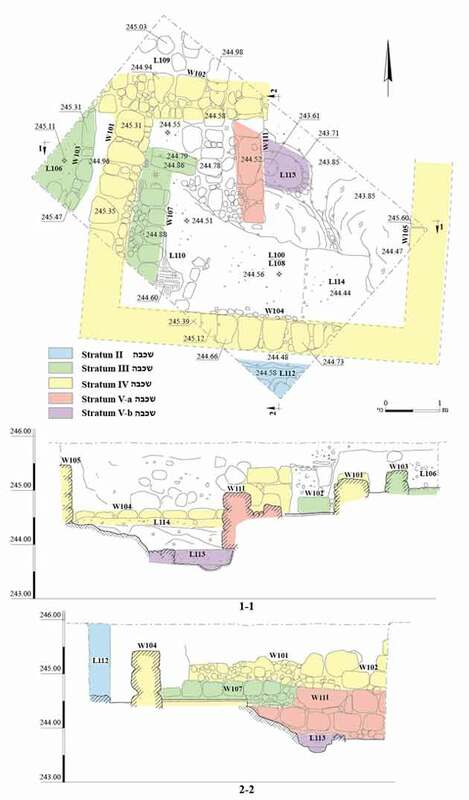 Numerous excavations were conducted throughout the village, around the church, yielding settlement remains that range in date from the Middle Bronze Age to the Ottoman period (Avshalom-Gorni 2011; Abu Zidan 2014; Dalali-Amos 2014; Yannai 2016; Atrash 2016, and see references cited therein). 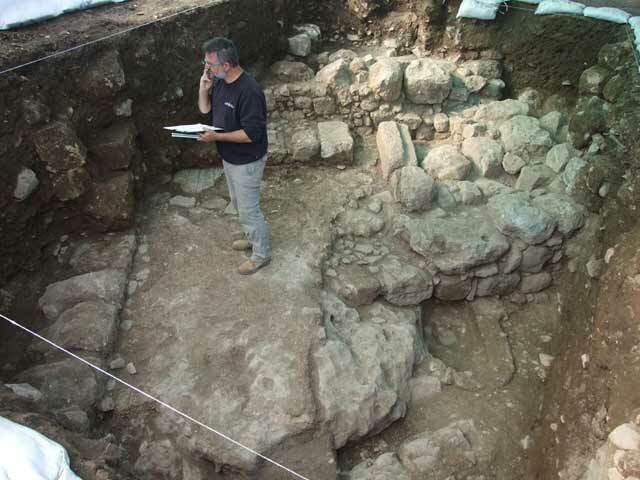 Remains of five settlement strata were uncovered in the current excavation (Figs. 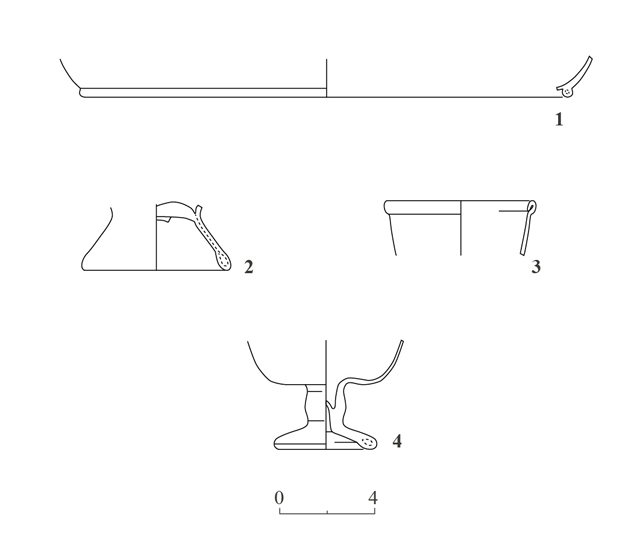 2, 3): construction debris from the time of the British Mandate (Stratum I); refuse pits from the Mamluk period (Stratum II); a bench and an installation from the Abbasid period (Stratum III); remains of a room belonging to a residential building from the Umayyad period (Stratum IV); and wall remains from the late Byzantine period, which covered part of a winepress collecting vat from earlier in the period (Stratum V). Stratum V (Byzantine period). An elliptical winepress collecting vat (L113; 0.60 × 0.95 m, depth 0.3 m; Fig. 4: Stratum Vb) was uncovered. The vat, treated with hydraulic plaster, belonged to a rock-cut winepress; a shallow round settling pit (diam. 0.3 m, depth c. 0.1 m) was hewn in its floor. The collecting vat was covered with a layer of gray soil fill mixed with small fieldstones and a few pottery sherds from the Byzantine and Umayyad periods, including a fragment of an Umayyad jar made of buff-brown clay and decorated with a black design (Fig. 5:1). The winepress went out of use in the late Byzantine period, when a wall (W111; Fig. 4; Stratum Va), the purpose of which is unclear, was constructed over the western part of the collecting vat. The wall was built of small and large nari fieldstones. Its northern part was founded on small fieldstones, used to level the area, whereas its southern part rests on bedrock (Fig. 2: Sections 1–1, 2–2). 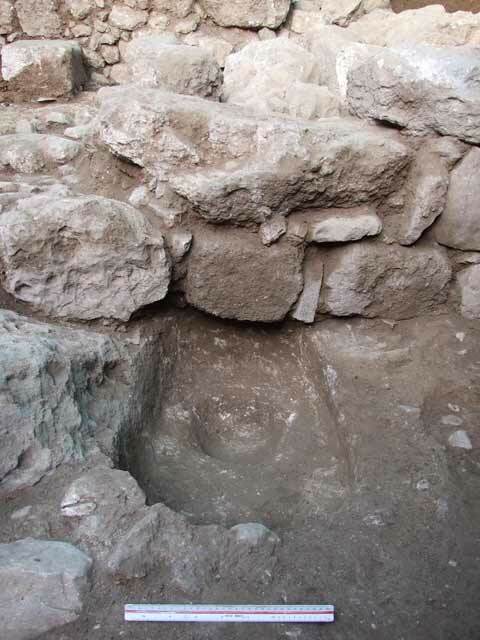 The winepress was probably associated with the Byzantine building complex unearthed north of the excavation, near the Church of the Resurrection of the Widow’s Son (Avshalom-Gorni 2011). Based on the ceramic finds (not drawn) and a similar collecting vat previously uncovered in Nein and dated to the fifth–sixth centuries CE (Mokary 2002), the winepress can be dated to the Byzantine period. Stratum IV (Umayyad period). Wall 111 was partially dismantled; its northern part remained higher than its southern part. A rectangular room (3.5 × 5.1 m; Fig. 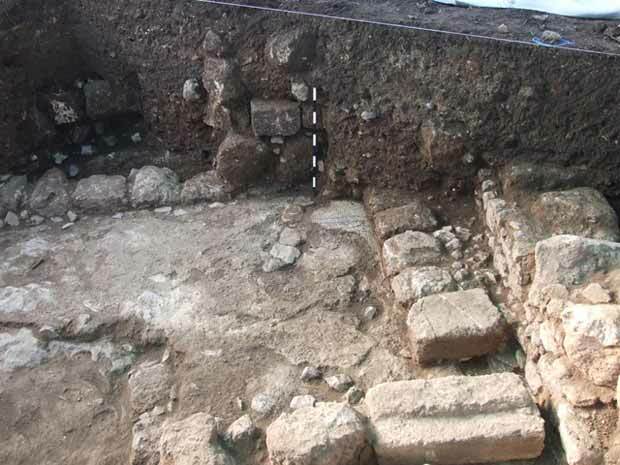 2), whose walls were partly founded on bedrock, was constructed over the southern part of W111 and the collecting vat. The northern wall (W102) was built of fieldstones, which were preserved to a height of two courses; its eastern end adjoins the northern end of W111 and is partially built over its remains. The western part of W102 extended beyond the limits of the excavation. The western wall (W101), which survived to a height of three courses, was similarly built of fieldstones; its western face consisted of large stones, whereas its eastern face was built of small stones. The wall continued southward, beyond the excavated area. The southern wall of the room (W104) was built of large nari ashlars preserved to a height of three courses. It continued eastward and westward, beyond the limits of the excavation, and probably adjoined the room’s eastern and western walls (W101, W105). Only a small segment (length 0.6 m) of the western face of the eastern wall (W105) was exposed; its construction was identical to that of W104. The eastern face of the wall was situated outside the excavated area. A white mosaic floor enclosed within a geometrical black frame (L110; Figs. 6, 7) was laid in the room; it covers the southern part of W111 and the remains of the Stratum V winepress. Only a small section of the floor survived in the southwestern corner of the room, where the floor bedding (L114), laid on the limestone bedrock, consisted of a thin layer of lime and a layer of crushed chalk containing small fieldstones and potsherds. The potsherds included a closed cooking pot from the sixth–seventh centuries CE (Fig. 5:2), an Umayyad-period jug with paint remains (Fig. 5:3) and a lamp from the Early Roman period (Fig. 5:4). A coin dating from 395–408 CE, bearing a cross surrounded by the inscription CONCORDIA AVGGG on its reverse (IAA 156944), was also found in the bedding. Stratum III (Abbasid period). A bench (W107; Fig. 2) built of a row of large nari stones was founded on the mosaic floor in the western part of the room, alongside W101 (Figs. 6, 7). Part of an installation of unclear shape, was exposed c. 0.25 m west of the room (Fig. 8). The installation’s wall (W103), built of a single row of medium-sized limestone and nari stones, was slightly rounded. The floor of the installation consisted of gray soil, crushed chalk and ashes, with evidence of a fire visible on it. Overlying the floor of the installation and the mosaic floor was a destruction layer of fieldstones and light gray soil (L106, L108), which contained pottery sherds and glass from the Late Roman and Byzantine periods (fourth–sixth centuries CE; Gorin-Rosen, below), as well as sherds from the Umayyad and Abbasid periods (mid-seventh – early tenth centuries CE). Most of the ceramic finds date from the Abbasid period; these include a bowl decorated with incisions (Fig. 5:5), two bowls decorated with a green monochrome splashed design (Fig. 5:6, 7), a casserole (Fig. 5:8), a closed cooking pot from the late ninth – early tenth centuries CE (Fig. 5:9), a delicate decorated buff-ware jug (Fig. 5:10) and a cooking pot lid (Fig. 5:11). Iron nails (Fig. 9) and a bone implement (Fig. 10) were also found. Stratum II (Mamluk period). All that remains from this period is a refuse pit in the southern corner of the excavation. It was sealed by a layer of gray soil fill (L112) containing several potsherds, including an olive-green glazed ring base of a bowl (Fig. 5:12). Stratum I (British Mandate; not represented in Fig. 2). A fill of light gray soil (L100, L109) sealed the Stratum IV building. This layer contained numerous nari fieldstones and debesh rubble that attested to the destruction of a building from the time of the British Mandate. Five glass shards were identified and dated to the later part of the Late Roman period and the Byzantine period (fourth–sixth centuries CE). 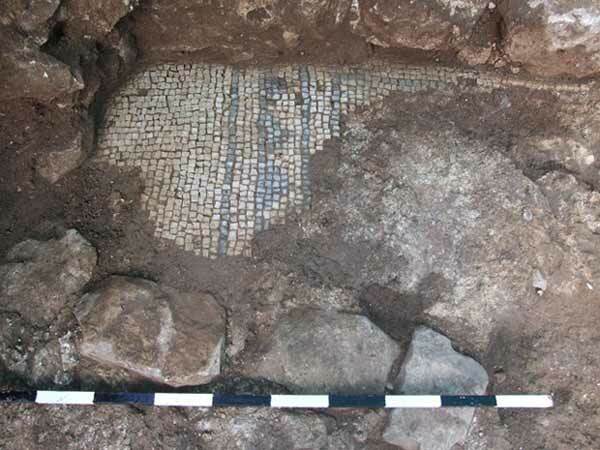 Four fragments were recovered from the destruction layer (L108) covering Mosaic Floor 110 (Fig. 11:1–3); one small fragment belonged to a fine, thin bowl rim (not drawn). The fragment in Fig. 11:1 belongs to a yellowish green bowl with a folded collar rim; the bottom part of the fold survived. Bowls of this type are characteristic of assemblages dating from the fourth – early fifth centuries CE. 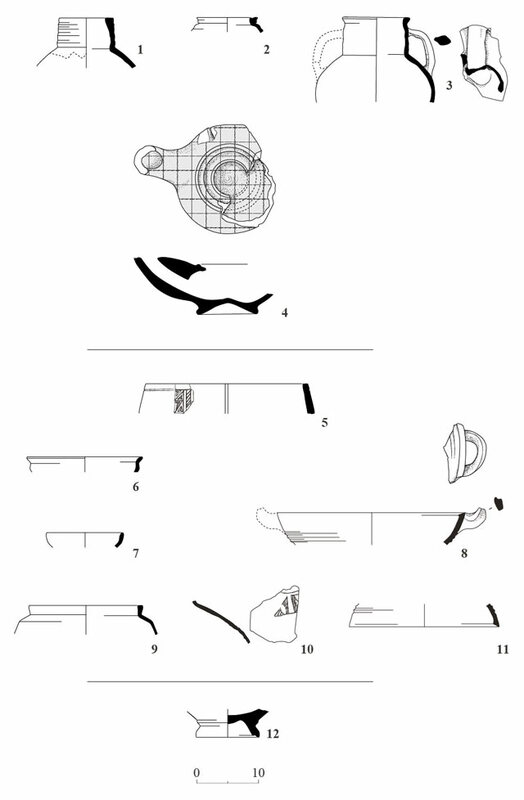 Approximately 100 fragments of such bowls were found in the workshop debris at Jalame, which was dated to the second half of the fourth century CE (Weinberg and Goldstein 1988:47–48, Fig. 4-7:72, 73) and at many sites in the Galilee. Also ascribed to this period is a raised ring base (Fig. 11:2) that probably belonged to a shaped juglet, a vessel found in the Galilee and in other regions. However, the base is high and narrow in comparison to bases of this type, such as those found at Jalame (Weinberg and Goldstein 1988:67–68, Fig. 4-29:242). A folded-in rim of a bottle (Fig. 11:3) belongs to a type that appeared in the later part of the Late Roman period and continued to be produced until the beginning of the Early Islamic period. An identical bottle rim was found in an excavation near Nein (Permit No. A-6737). The lower part of a wineglass was found in topsoil (L100): part of the body, the stem and the hollow ring base (Fig. 11:4). The wineglass was made of greenish-blue glass, without any weathering, and was asymmetric. The base, which was carelessly made, was obviously pushed into the stem. Wineglasses of this type date from the Byzantine period. Fragments of very similar vessels were discovered in a nearby excavation (Permit No. A-6737), in the Church of the Resurrection of the Widow’s Son. They presumably originated in a glass workshop that existed in the village or its immediate vicinity during the Byzantine period; glass industrial debris was also found in previous excavations in Nein (Gorin-Rosen 2014). The winepress collecting vat from the Byzantine period discovered in the excavation attests to agricultural activity, particularly the cultivation of vineyards. It is reasonable to assume that this agricultural activity was associated with the Byzantine building complex that was partially unearthed south of the Church of the Resurrection of the Widow’s Son (Avshalom-Gorni 2011). The winepress was destroyed at the end of the Byzantine period, and a residential building was erected in its place in the Umayyad period; a mosaic-paved room belonging to this building was discovered. The building was destroyed, probably at the end of the Umayyad period, restored with a modified plan during the Abbasid period and eventually demolished at the beginning of the Fatimid period. Activity at the site was resumed during the Mamluk period, when refuse pits were dug there and a massive Mamluk-period structure was erected nearby (Avshalom-Gorni 2011). The foundations of a dwelling built during the time of the British Mandate damaged the walls of the ancient buildings. Abu Zidan F. 2014. Nein. HA-ESI 126. Atrash W. 2016. Nein. HA-ESI 128. Avshalom-Gorni D. 2011. Nein. HA-ESI 123. Dalali-Amos E. 2014. Nein. HA-ESI 126. Gal Z. 1998. 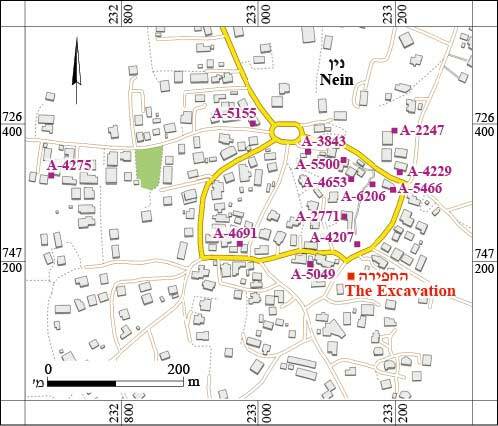 Map of Har Tavor (41), Map of ‘En Dor (45) (Archaeological Survey of Israel). Jerusalem. Gorin-Rosen Y. 2014. Glass. In E. Dalali-Amos. Nein. HA-ESI 126. Mokary A. 2002. Nein. HA-ESI 114:110*–111*. Yannai E. 2016. Nein. HA-ESI 128. Zori N. 1977. The Land of Issachar: An Archaeological Survey of the Gilbo‘a Hillside, the Jezreel Valley and the Lower Eastern Galilee. Jerusalem (Hebrew). 2. The excavation, plan and sections. 3. The excavation, general view looking west. 4. Stratum V, collecting vat, looking west. 6. Stratum IV, remains of a room, looking south. 7. Remains of the mosaic floor, looking west. 8. Stratum II, remains of an Abbasid installation, looking east. 10. 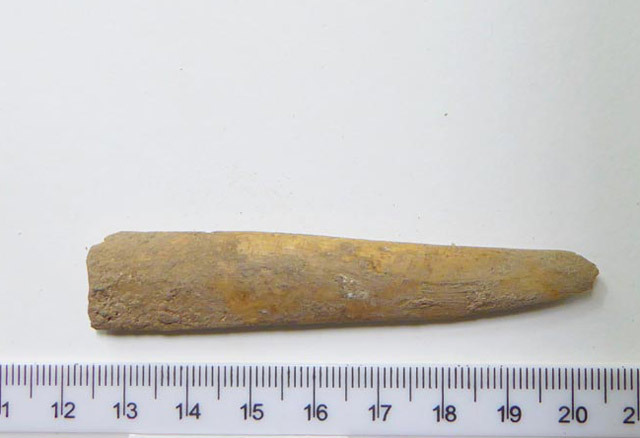 A fragment of a bone implement.